We provide downloadable versions of the Early, Mid, and Late-war Quick Reference Sheets for Flames Of War, the More Missions Pack and the Early-Late Special Rules and Warriors book in its entirety. Learn more about these very useful 4th Edition downloads below. Force composition in V4 Mid War allows for a huge variety of armies to be built, mixing and matching all sorts of support options to represent forces from many different theatres and battles, as outlined in Phil’s Companies Accompanied. To help illustrate these changes, and to make building your forces simple and straightforward, we will be sharing with you a series of Force Diagrams showing all the different options you have available to you. A new rules set always results in questions about how the finer points of the game should work so Lessons From The Front is the place to go to find answers to some of the harder questions. These are living documents that we will update as often as possible but please bear in mind that whilst we listen to feedback in the forums (and other places) we need to take a considered approach before implementing any changes. 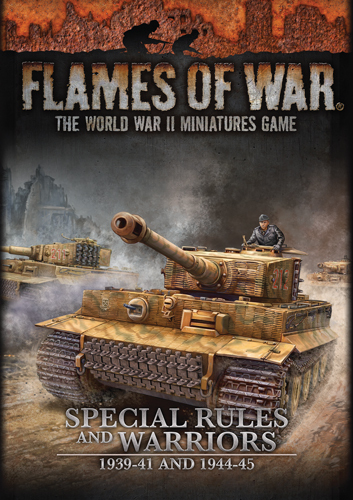 With the release of a new edition of the Flames Of War rules, there are a few changes to how the rules work. With a vast library of published Intelligence Handbooks available to use for building forces for Flames Of War, we didn’t want to lose any of those great books in the transition. 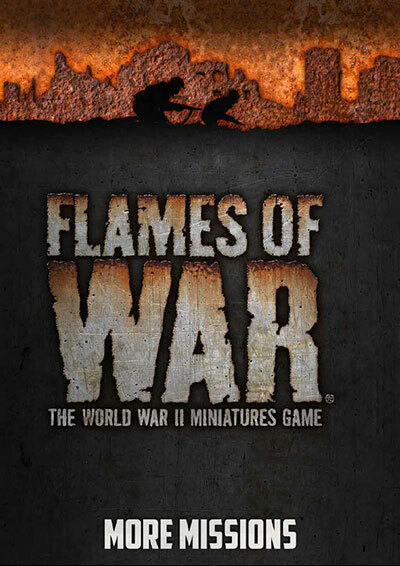 Flames Of War, Special Rules and Warriors, 1939-41 and 1944-45 provides you with updated special rules and Warriors so that you can continue to use your Early- and Late-war Flames Of War forces with the new Flames Of War, 1939-41 and 1944-45 rulebook. Under the heading of each Intelligence Handbook, you will find a list of rules sorted by nation. Each of these sections also contains updated versions of the Warrior rules from the same Intelligence Handbook. Last Updated on 27 June 2017. With the release of 4th Edition, we provide a PDF version of the Early and Late-war Quick Reference sheet for you to download. With the release of 4th Edition, we provide a PDF version of the Mid-war Quick Reference sheet for you to download. The Flames Of War More Missions pack is an optional expansion for tournaments and players looking for quick pick-up games. It contains new versions of the missions from the rulebook that use a different set of victory conditions and the optional Battle Plans mission selector. • Annihilation • Breakthrough • Bridgehead • Counterattack • Dust Up • Encounter • Free For All • Hasty Attack • No Retreat • Rearguard. Each mission now has a double page telling you how to play the mission and detailing the mission special rules. You can either print each mission out on a single piece of paper (front and back) or print it as a booklet with each mission on facing pages. The Battle Plans mission selector allow you and your opponent to choose the most appropriate missions for your forces. Each player chooses a plan (Prepared Attack, Hasty Attack, or Defend) and then you look up a table to see which mission to play and who will be the attacker.